8cr13MOV and AUS-8 – What Do You Need to Know About These? There is no doubt that most of the hunting knives are made from steel materials. However, the steel materials also have several different types that you may not know. As a hunter, you should know more details about these to have a better choice. Even some people have no idea about the difference between the 8cr13MOV and AUS-8. For this reason, you need to keep on reading our review. Stay tuned! There are many steel types available on the market, but you should have a solid understanding of this steel material; especially how they react to the heated condition. Exotic steel with a low heat resistance will not keep well and the price point is also not expensive. Tool steel is hard steel used in cutting other tools. You will recognize some common steels in this group such as D2, O1, Crucible’s CPM series, etc. Some also are higher speed steels like M4. Carbon steel is made for rough usage when durability and toughness factor is crucial. You can see this material with some survival knives and machetes. Producers often make a sharp edge and this point is easy to sharpen again. 1095 is the most common carbon steel that you enable to see in every hunting knife. Stainless steel is a combination of carbon steel and chromium to combat corrosion and other properties. These will boost performance levels and the expense of quality firmness will be stable. To get high-quality of the stainless steel in each hunting knife, this must have 13% chromium or more. You will see stainless steel in some common hunting knives such as EDC knives, some series of steels (400, 154CM, AUS, VG, CTS, MOV, Sandvik and Crucible SxxV). The 420HC is an old type of steel which added more carbon to the recipe of 420. (HC is high carbon material). It is low carbon content, so it is soft and it has a low number of carbides. Although it is quite soft, the additional micro-crystals in the steel offer the firmness to make a steady and sharp edge. 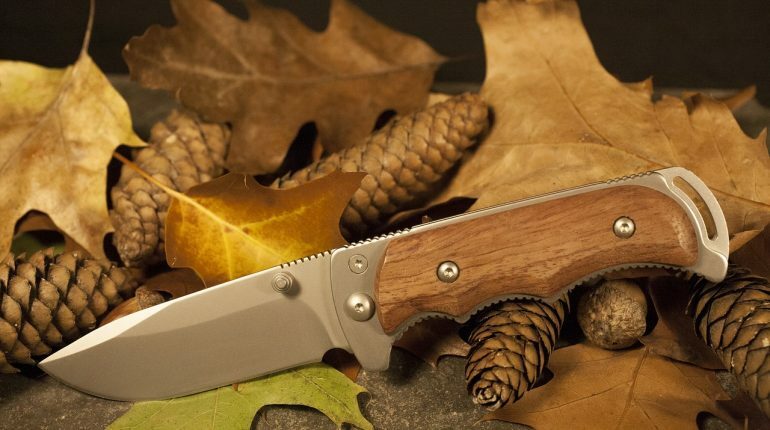 Though the 420HC cannot keep an edge quite well, this is a really tough, low-cost steel, and stain resistant material for a good hunting knife. The AUS-8 is one of the most popular stainless steel for every object; especially for hunting knives that producers need to use from countries around the world. It is hard, solid, and stain resistant enough to withstand any kind of condition and protect the main things. Although it could not hang long with stylish metal steels, you still find a right choice for your hunting knife. The 8Cr13MoV is the main material for all Chinese produced steels and you may find this material in the latest knives of Chinese. They have total 9th series and it is said that 9Cr is the highest quality material of these series even these are better than AUS-8. In fact, the 8Cr is not better than the AUS-8 because it is not solid enough and it is quite cheap. Well, have you identified the difference between 8CrMOV and AUS-8? I am pretty sure you have gotten these! 7Cr and less are not rated the top-notch materials, so you can do not mind these types of saving your bucks and time. 1095 is also an old high carbon material which is tough. People found this on a large number of conventional style folders, but it is a daunting task to get these in the heat. Luckily, I found it without much hassle. However, it made some bad dings on the edge when I need to improve it to a higher level on a thin blade. 1095 do not cost too many bucks, so the price of a hunting knife in this material is also affordable. And you will have a better edge with the thickness blade. For me, I do not think those materials and types of hunting knives are difficult to have a deep understanding. When you see 8Cr13MOV and AUS-8, you completely find out their different points at all. Hope that you will find the right knife for the upcoming hunting season once you have recognized its materials. Feel free to share with me about your hunting experience and how to select a suitable hunting knife from your situation.